Emory Arnold, music education sophomore, performs at the National Association of Teachers of Singing student recital on Nov. 5 at Akin Auditorium. Photo by Denush Vidanapathirana. Akin Auditorium was silent, save for the voices of the five sopranos. All 23 pairs of eyes and ears trained on the performers at the National Association of Teachers of Singing student recital Nov. 5 at 3 p.m.
To prepare for the 67th Texoma NATS Regional Conference and Student Auditions to be held on Nov. 8 at Texas A&M Commerce which hundreds of colleges across Texas, Oklahoma and Texas will participate in the contest, the recital showcased a few of the students that will audition. Each soloist sang three songs, accompanied by pianist Sandra Cunningham. The songs were of English, Spanish, Italian, German and French origin and were picked for the students by the vocal coaches. 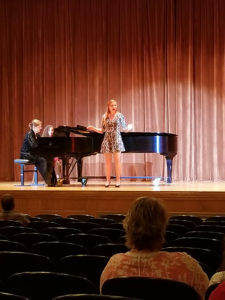 In preparation for the recital and the competition, Chloe Dunlap, music education freshman, said they had a lot of practice so far because there are various languages to go over. The recital helped with the preparation for the competition, according to Arnold. She also said she felt that good about the competition going in.